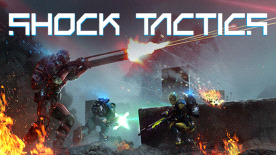 Lead your strike team against smart enemies that employ a large array of tactics. Know your enemy, build a strategy, rule the battlefield. Harness the power of the alien artifacts to upgrade your base, built new weapons and armor and train your soldiers with different abilities to fit your playstyle. Action Points allow you to move your soldiers with full control and the interrupt system enables long sprints, that are stopped when new enemies are spotted, so you can assess the situation and spend your remaining Action Points accordingly. Always drop right into the action and bring the fight to the enemy before he can reinforce his positions. Play fast tactical assaults on time sensitive objectives and stay in full control. The procedurally generated world map leads to different strategic situations in each game session. Fight in three different environments of Hephæst to claim the alien artifacts. Experience a story revealing the secrets of the planet while the great factions steer towards a final battle deciding their fate in the galaxy.